Anyone who has ever delighted in a baby’s bright smile or darling toes will instantly connect to this adorable picture book with simple text and adorable illustrations by Brooke Boynton Hughes. With just the right balance of sweetness and humor, this is a soothing ode to all the wonderful bits and pieces that make up a cuddly, snuggly baby. "In ardent, rollicking tribute to the sweet charm of babies, a mama and papa laud the simple, yet special attributes of their own. 'Rosy cheeks. Button nose. Little fingers. Tiny toes' is the start of what becomes a heartfelt love song to little ones. VERDICT: A wonderful choice for baby storytime programs." 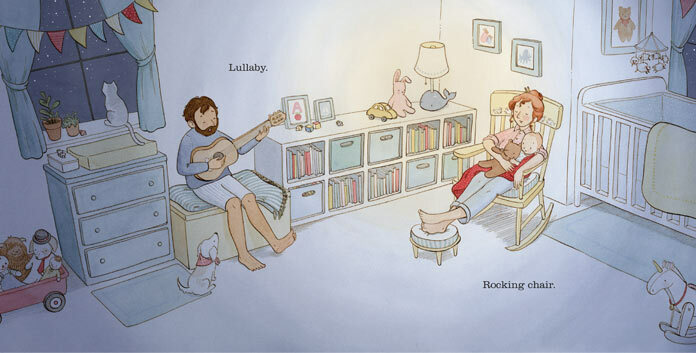 "[Hughes'] crisp, fluid line and soft washes of color convey comfort and coziness, while DiTerlizzi’s pared-down rhymes move along with a meditative, bedtime-ready cadence. Baby makes three—or four, counting the pooch—but there’s no question in these pages who’s Numero Uno." "Adults will want to read this again and again with baby cuddled close. A joyful, warm and lovely bedtime story."